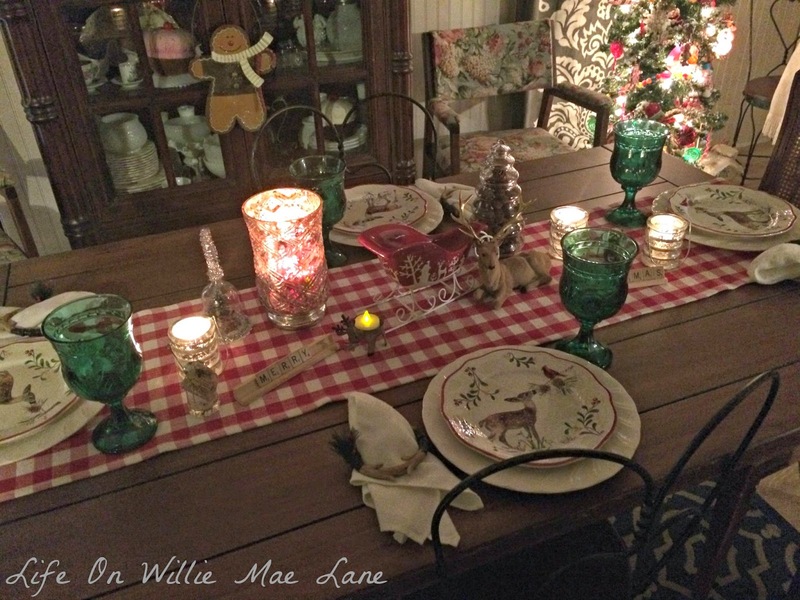 It's beginning to look a lot like Christmas here on Willie Mae Lane. I am 98% done decorating! It is a lot of work but when it's all done and I can sit down and enjoy the fruits of my labor, it is worth it. Tonight I am finally able to sit down and enjoy it and as I look around at all the lights and festive decor, I am happy. Yes, it was worth it. I want to share my favorite new addition to my decor this year. You may remember this little truck ornament I shared a few days ago. I kind of fell in love with it at World Market and it had to come home with me. 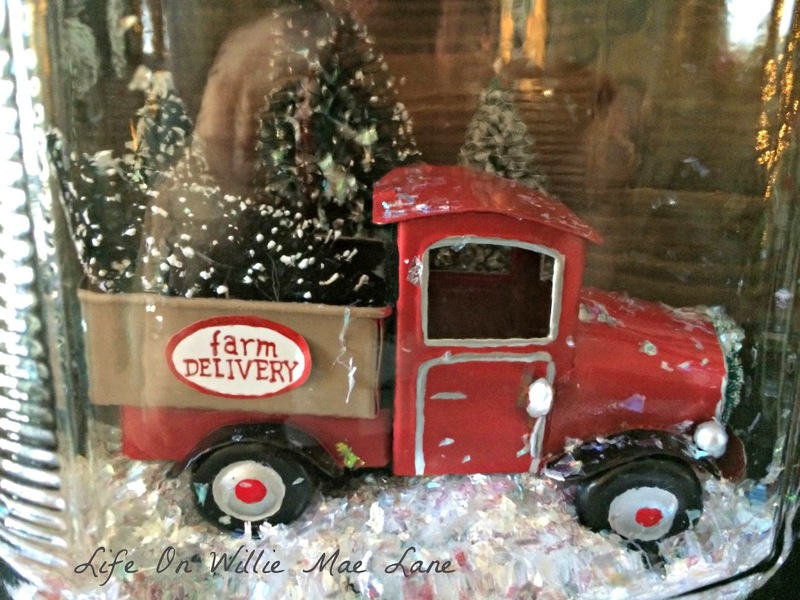 I had seen folks all over bloglandia with the cutest little vintage trucks or cars with Christmas trees in the back or strapped to the roof and I just had to have one for myself. I haven't had any luck finding a vintage one, but when I spotted this one I knew it would work. 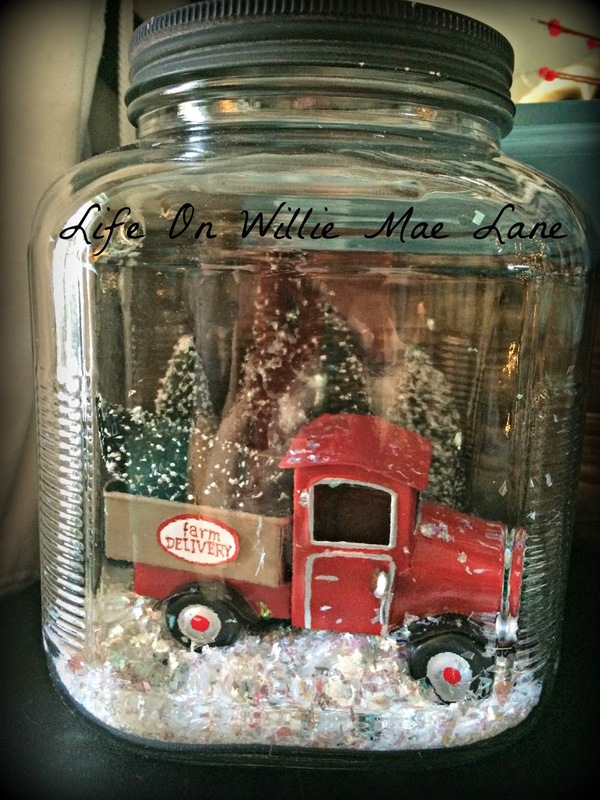 I had also seen some in apothecary jars and this one was small enough to create the vision I had for it. It was actually perfect and the cute little wreath on the front just sealed the deal. 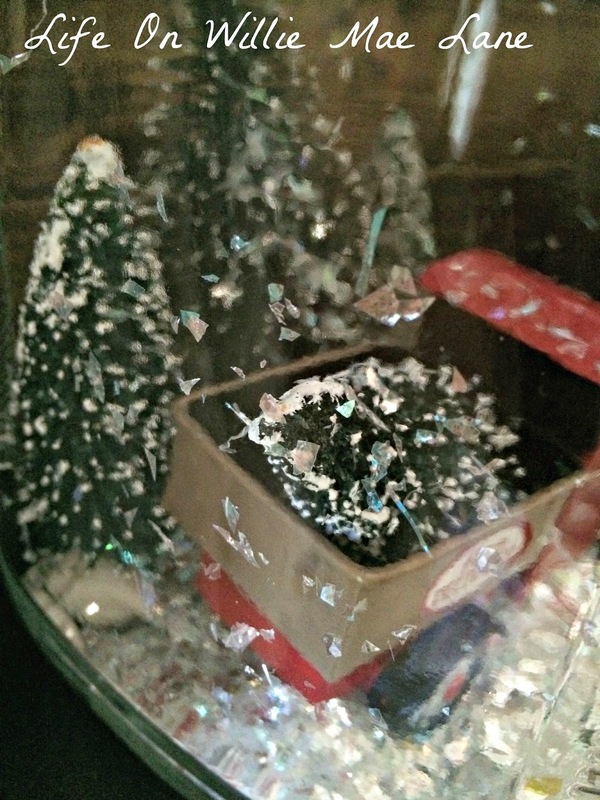 I might not get real snow here in Florida, but I can have some in this little scene in my jar. 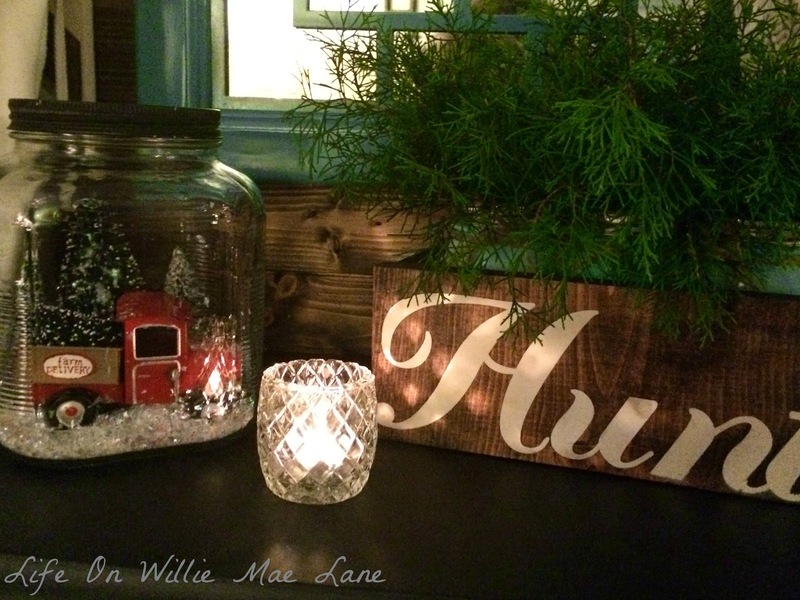 It sits upon my little heater along with some freshly cut cedar and a quilted crystal votive cup. 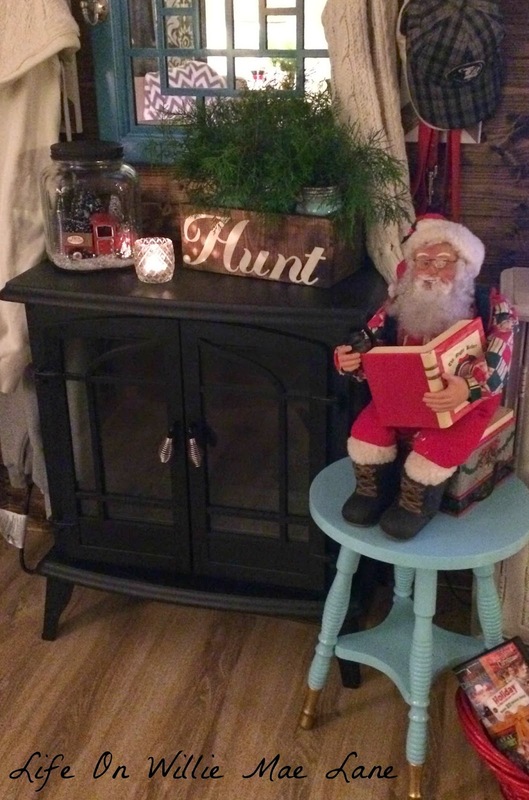 Santa sits on the stool with his pipe in one hand and a book in the other. I have had him since my kids were small. He was a gift from my mother-in-law. The base is a tape player and it came with a tape of the night before Christmas. Not sure if it still works or not, but he is always part of my decor. And, for those of you who read my post yesterday and remember me mentioning adding some fresh cedar to the tablescape, here is an updated picture. It's just what the table needed. I am feeling a little out of sorts tonight. I am returning to work tomorrow and while I am happy to see my sweet kinders, I am not looking forward to the stress and pressure of my job. The joy has been stolen from teaching and there is just too much to do and keep up with. It is nearly impossible. I am going to try my best to make the next three weeks as fun and magical as I can for my students though. Christmas time should be fun. I'm still going to "teach", but I want them to have fun while they're learning. I'm also a little sad tonight as I remember that tomorrow, December 1st, makes three years since my father-in-law passed away. I miss him a lot and wish he could have had more time on this Earth. Anywho, not trying to be a downer, I'm just sharing my feelings. 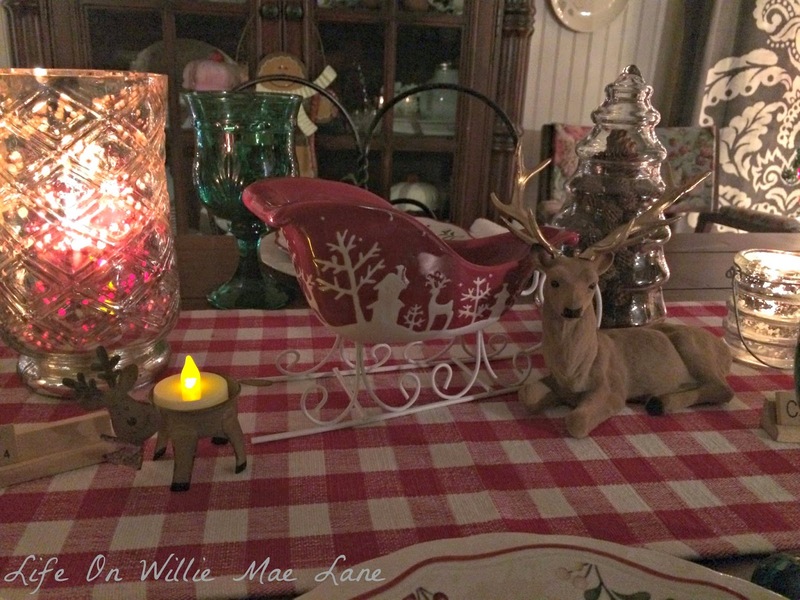 I hope to find some time to post some more of my Christmas decor this week. We'll see! As for that list I had for my break, I am happy to report that the majority of the things I had on it were accomplished and I had a lot of fun too. I spent some quality time with all my loved ones and for that I am grateful. Hello friends. I hope this finds everyone doing well. I trust you had a lovely Thanksgiving. I sure did. Mine was filled with family and good food. I celebrated at my Aunt Loretta's house with my family, my mom and day, my sister and her kids, as well as three of my aunts and three uncles. It was a nice day. I have been busy trying to get the house decorated since then. I have so much Christmas stuff and it is so much work to decorate every year. This year I decided not to decorate the guest room and guest bathroom. I did stick a couple small things in the bathroom, but I did not officially decorate it like I normally do. 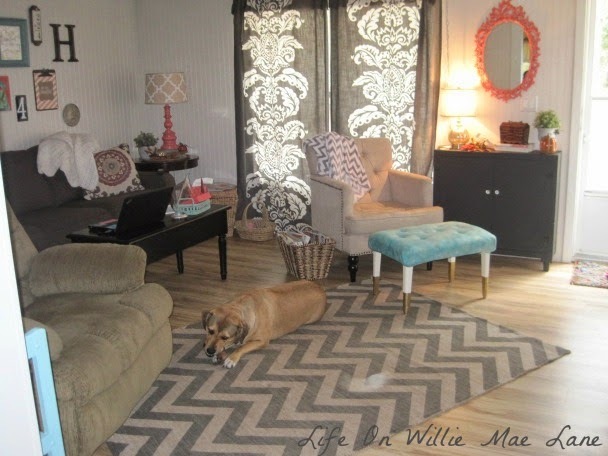 I did decorate the dining room, living room, and kitchen. I spent the most time in the dining room. I will share the table and buffet with you today. 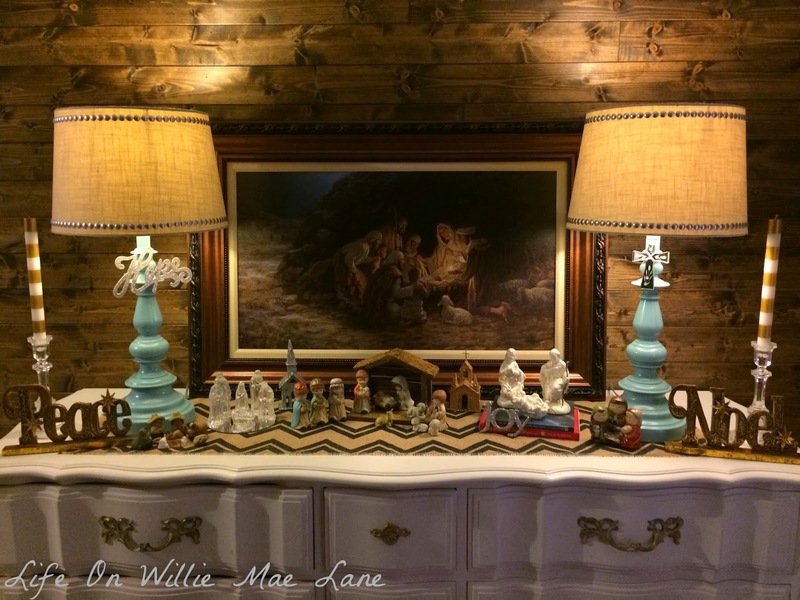 I love how the buffet turned out with my picture of the nativity and my mini nativities. I got this picture at Kirkland's a few years ago when Miranda worked there. She was able to get it for me a couple days before Christmas after it had been marked down significantly. With her discount, I think it only cost around $8. 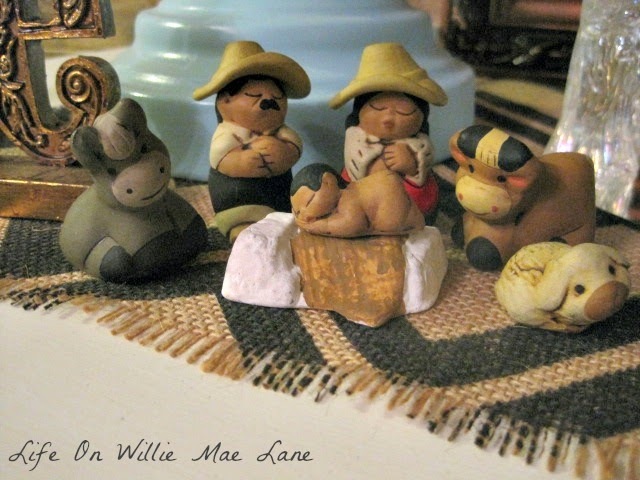 I have a few small scale nativity sets. The one in the middle I have had for years. 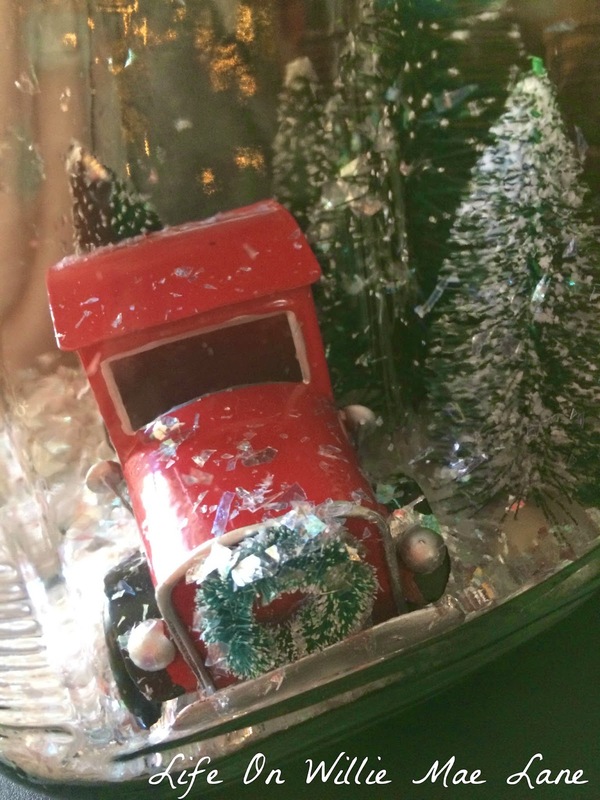 It is one of the first Christmas things I bought as a young married woman years ago. The iridescent glass one to the left is also several years old. I have probably had it 20 years or so. I think I ordered both of them from home decor parties. Remember when those used to be popular? The white one to the right is a thrift store find from a couple years ago. It has a pearlescent sheen to it. So pretty. This cute little set came from Peru. My cousin's wife is from Peru and she bought this back to me several years ago after she went home to visit her family. Isn't it the cutest thing? 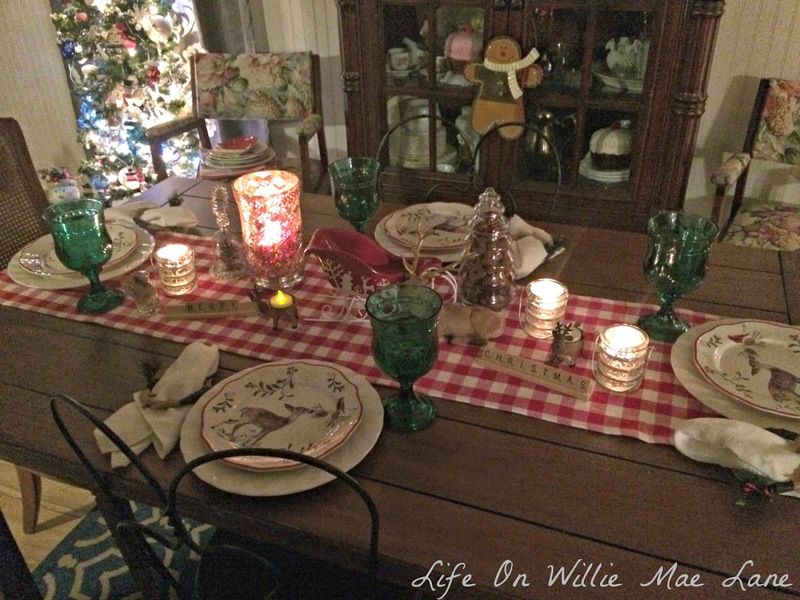 The table got it's first Christmas tablescape of the season. 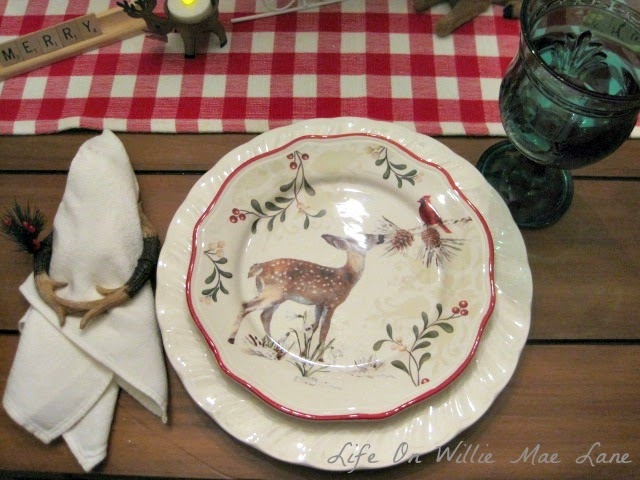 I used my new Better Homes and Gardens plates I got from Wal Mart a few weeks ago. I have been patiently waiting to use them! 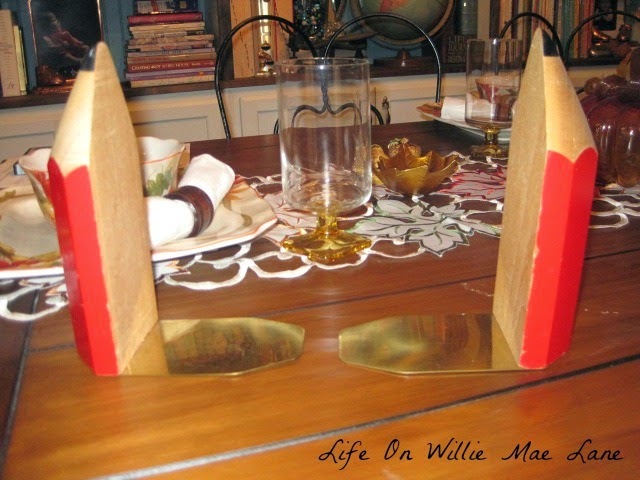 I bought the napkin rings a couple days ago after reading about them on a blog. They are ornaments from Wal Mart. They look like antlers which is perfect to go with the deer plates. 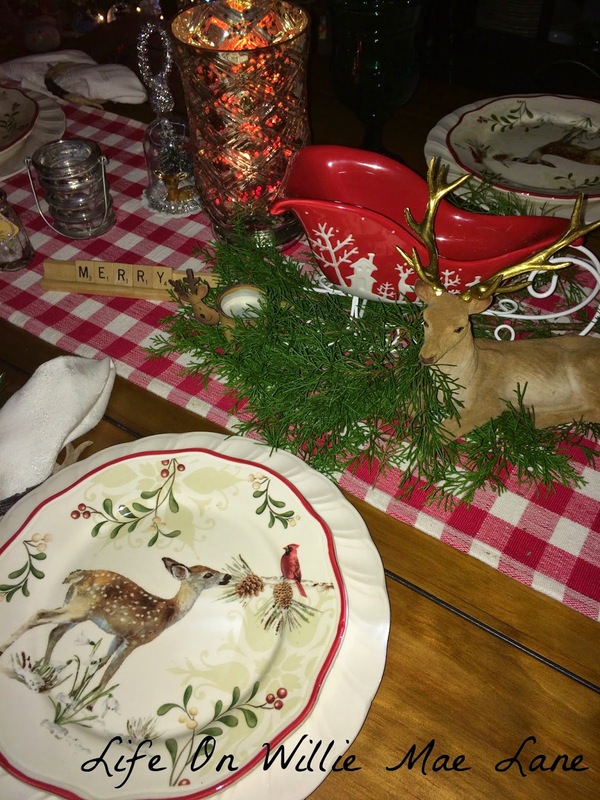 Let's see...I think almost everything on the table was thrifted or bought on clearance, except for the plates and napkin rings. I love this red and white checked runner. It works well for several holidays. Here's the table with the lights off. I love the warm glow of candles. A slightly different angle. You can see a glimpse of my two pencil trees in the photos. They are in front of the dining room windows. I will be sharing them soon. 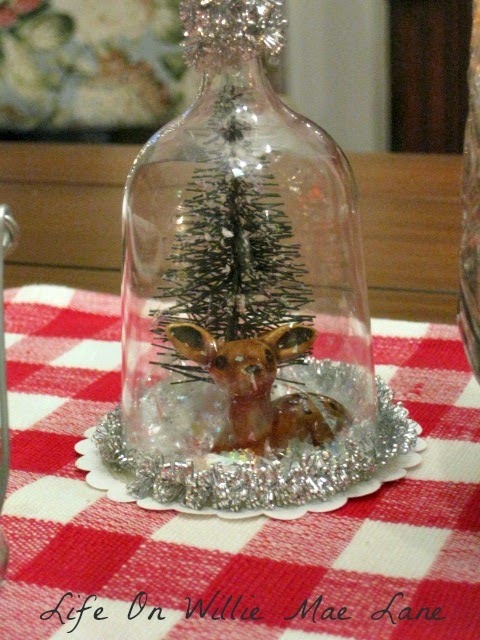 I am not thrilled with the centerpiece, bit it will do. I plan to cut some fresh cedar and maybe some holly tomorrow and will be adding it to the table. 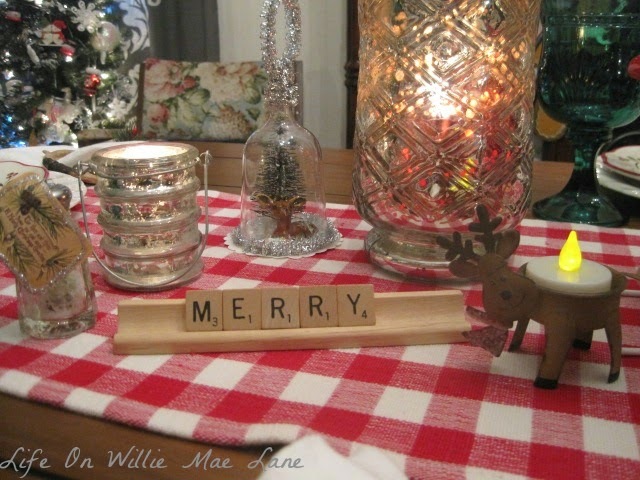 I used my large and three small mercury glass candle holders. I love mercury glass. This is an ornament I made last year. It has a sweet baby deer inside. I bought this buck last year and painted his horns gold. 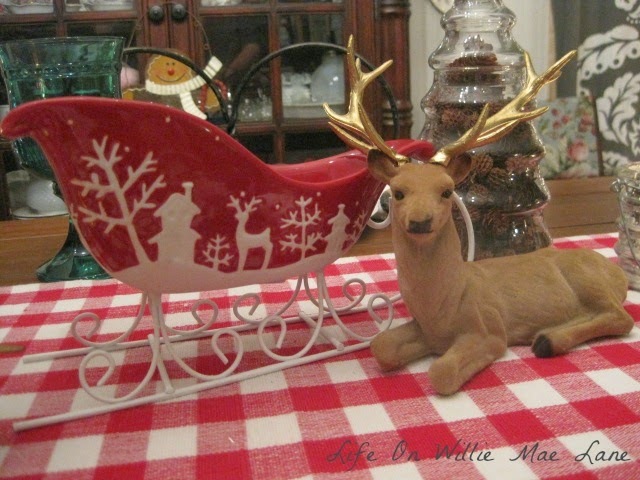 The sleigh was bought a couple weeks ago at the Goodwill. I think it is so pretty. 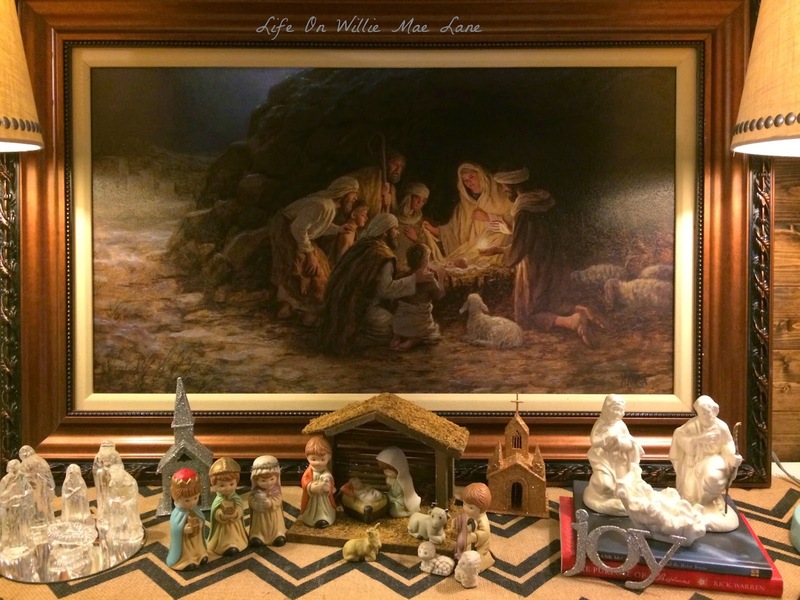 I hope you enjoyed a little Christmas cheer to start the season. 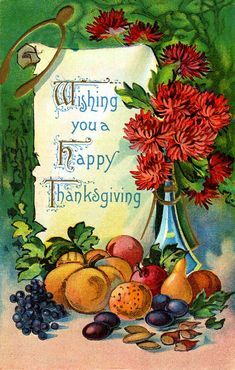 Have a blessed and beautiful last day of November. 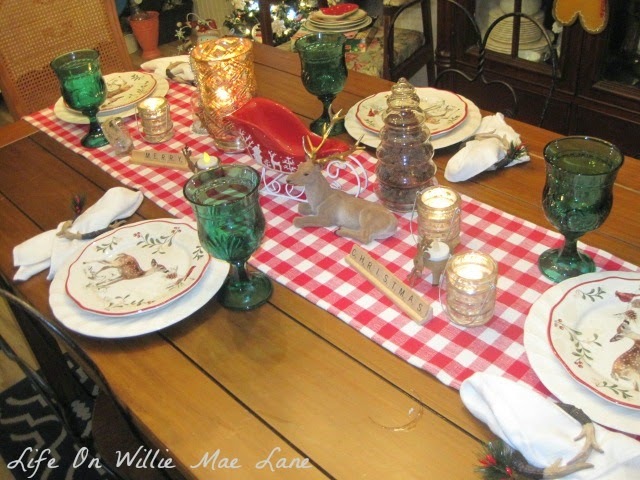 During this season of thanksgiving, I would like to thank each of you who visit me here on Willie Mae Lane. When I started blogging almost two years ago, I had no idea I would make so many new friends. 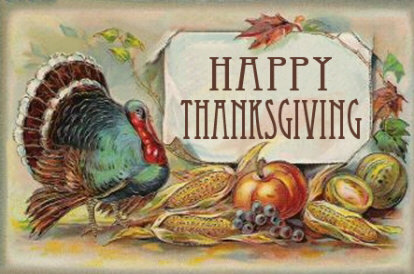 I am thankful for each and every one of you and wish you and yours a blessed and beautiful Thanksgiving. And for those of you who live in another country...have a blessed and beautiful day as well. And just for fun...this vintage postcard cracks me up! This isn't exactly what we think of when we think of dressing a turkey, is it? I thought it might give you a chuckle. Is your list as endless as mine? I have had such a hard time staying caught up lately. Tell me I'm not the only one...lol! 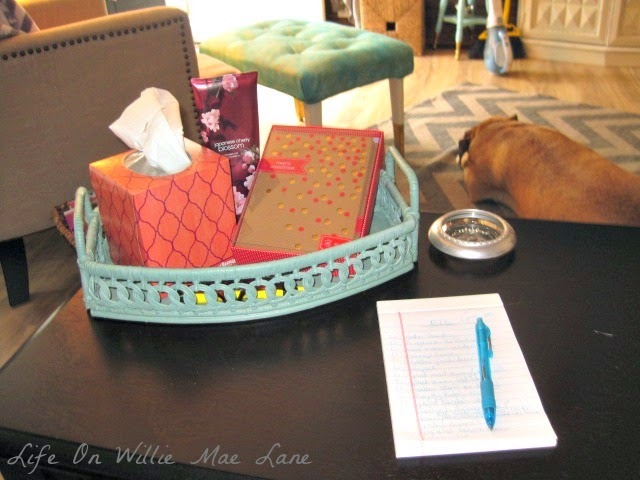 My list on that white notepad below is not one, but two pages long! I am happy to say I have checked off many of the things on the list. Let me share a couple with you today. I cleaned under my rug in the living room and turned it on the diagonal. I really like it like this! 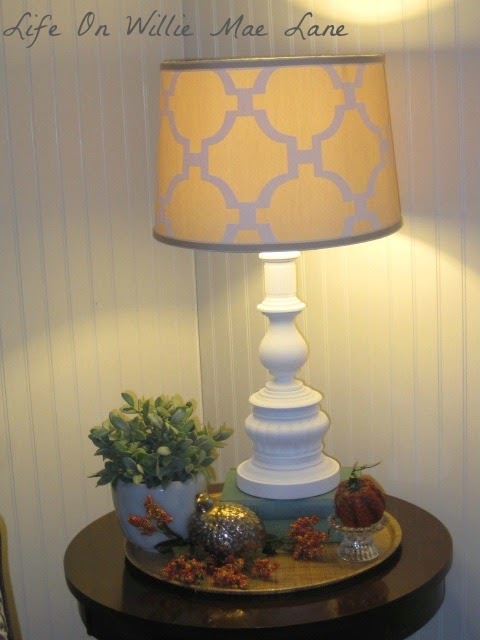 Remember my coral lamp...you can see it in the photo above. Well, I decided coral isn't a good color for winter, so I repainted it. Here it is...and I love it too! Now I'm trying to decide what color to repaint the coral mirror as well as a picture frame in my living room. Decisions...decisions! I forgot to mention that I visited the Goodwill while I was in Tallahassee. While I didn't buy even one thing for myself, I did find these for Miranda. 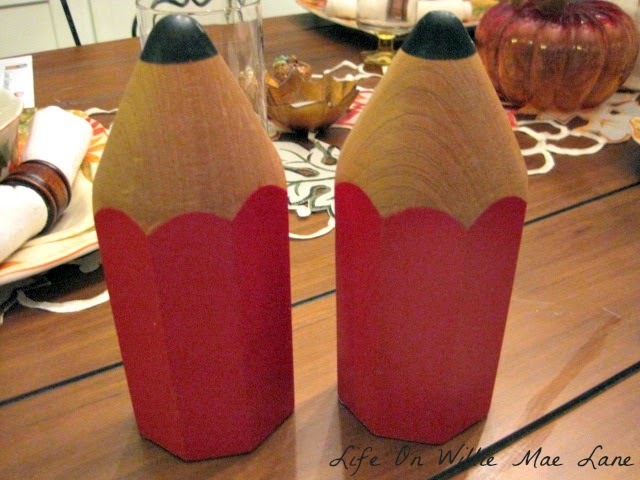 Cute pencil bookends. Miranda is an aspiring writer...I mean the girl amazes me! I have no doubt that she will someday be a published author. 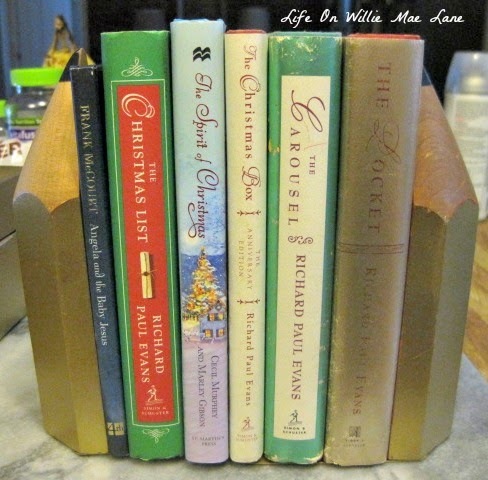 These bookends seemed to be perfect for her. But...we didn't like the red. I had a plan in mind though, so I bought them! 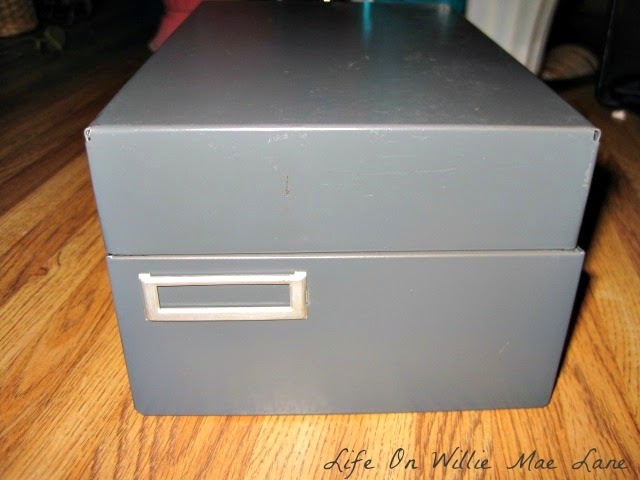 I also found this vintage metal file box and showed it to her. She loved it too.....but again, not the color. now they are classy gold! I stuck a few of my books between them to see how they look and I like them. I think Randa will too. It's a dreary, rainy day here and my photos reflect that today...sorry! Book Buddy +. It is so cool! It scans the bar code and pulls up the book. You can then decide how you want to categorize your books. I am saving mine by author for the most part, but I also will save some by theme. 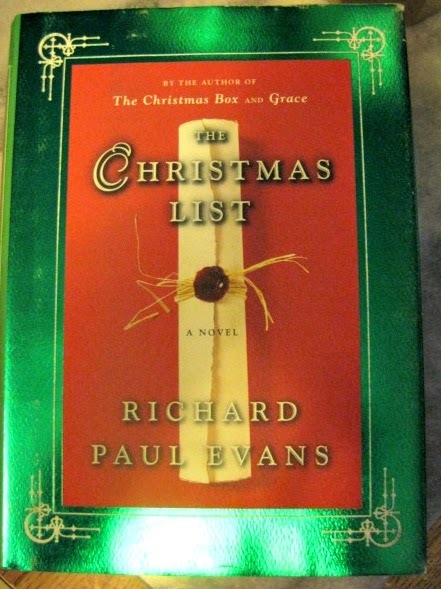 For instance...my Christmas books. This way, when I'm thrifting and find a book I want, I can make sure I don't already have it. I have bought duplicates more than once! When you have as many books as I do, it's easy to forget what you have. I can also make notes on the app if I loan a book out, or if I have the soft cover but am looking to replace it with a hard cover book. I can create a wish list and many other things. Anywho, it's a great app. 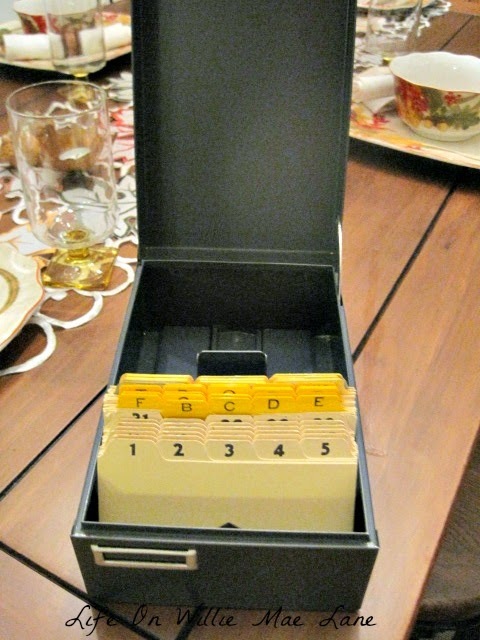 There is a free version, but I wanted the upgraded version in order to put all my books in it. It was $4.99. I hardly ever pay for an app, but this one was worth it to me. Ta Ta for now! I am off to tackle some more things on my To Do list! It's Monday and I didn't have to go to work this morning because I am off ALL week! I wanted to start my week off by sharing a recap of my weekend. My mom and I got up early Saturday morning and headed up to Tallahassee. Most of you know my daughter, Miranda lives there. She moved up there a few years ago to attend Florida State University and she has decided to make it her home. I love to go visit her in the "big city". You see, this country girl lives in what we refer to around here as "the boonies". That means I live in the woods...literally. I am 20 minutes from my school and it is located in a one red light town....tiny! Anywho, I love to go stay with Randa because she lives right in the middle of the city and is surrounded by awesome shopping places and restaurants. It would not do for me to live there as I would never cook and I would gain 100 pounds...lol! 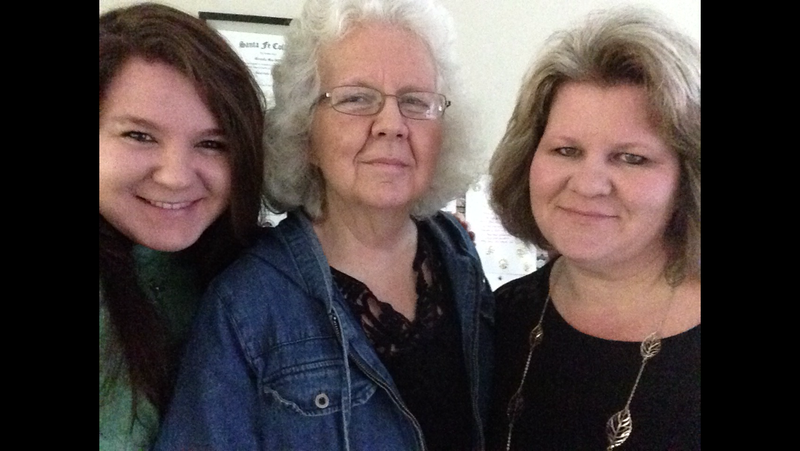 We began our day by picking Randa up at the service department where she was getting some recalls repaired on her car. 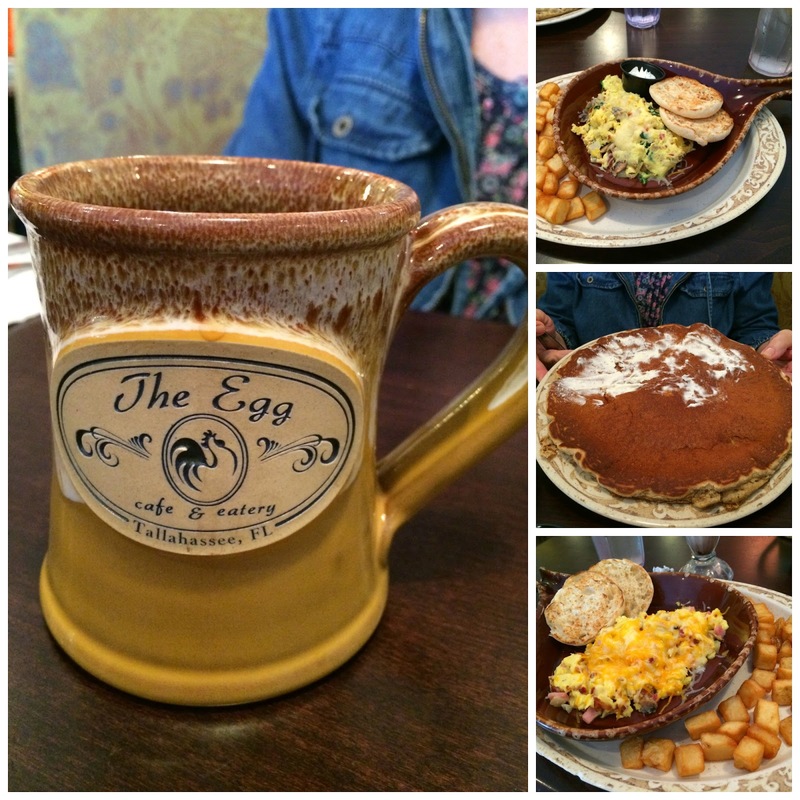 We went to The Egg....formerly Another Broken Egg, for breakfast. It was so yummy! I had the Popeye scrambler which had spinach, bacon, onion, and mushrooms in the eggs. So tasty! My mom ordered the large pancake. Check it out...she had no idea it was bigger than her head! She could not even eat half of it! Miranda had a scrambler of some sort as well. Most of the weekend was rainy and dreary, but it was still so pretty to me. 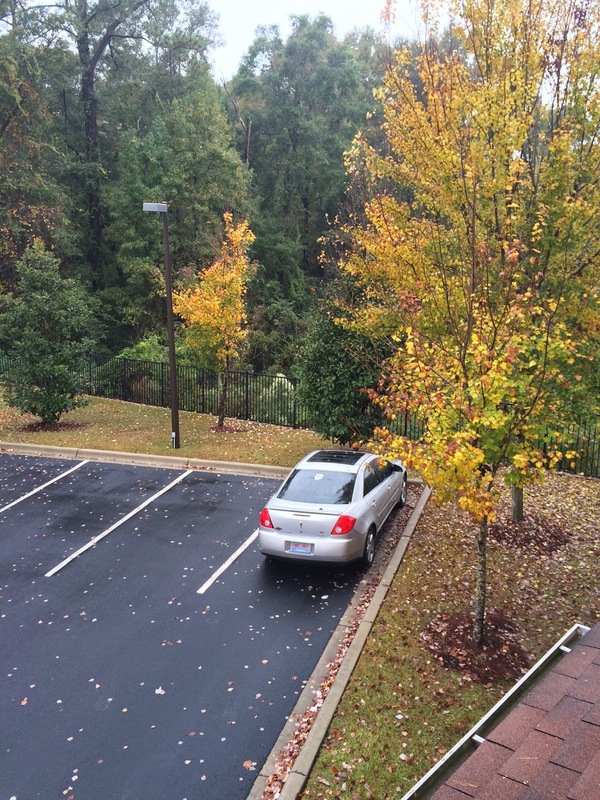 I enjoyed seeing the pretty fall leaves scattered all over the ground. We don't have such pretty leaves where I live. Miranda is two hours north of me and it makes a big difference. Tallahassee gets rain almost daily and it gets colder there as well. It's a very hilly city for Florida as well. I just love the look of the land there. This is taken from Miranda's balcony. See the fence in front of her car? 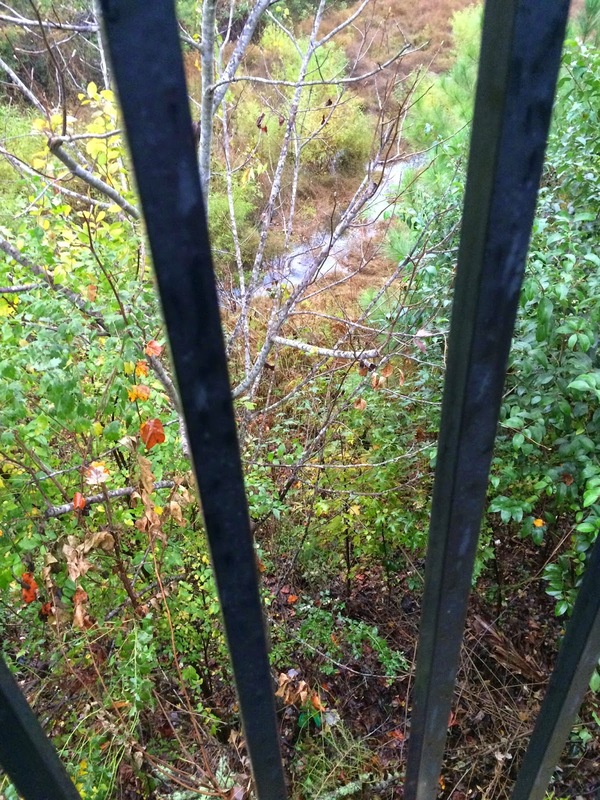 There's a ravine on the other side. It's a pretty steep drop down. There was water in the bottom. 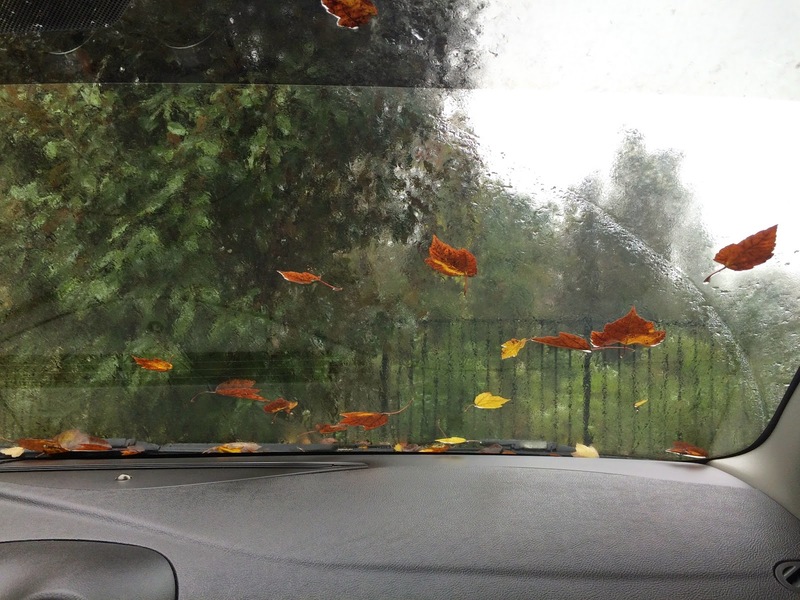 Pretty leaves stuck to the wet windshield. After breakfast, we dropped Miranda off at work. She had to work for a few hours, and mama and I went shopping. I found two new coffee cups at Marshall's. My goal is to collect a few white cups with black designs for my kitchen. I want to create a coffee/hot cocoa station. 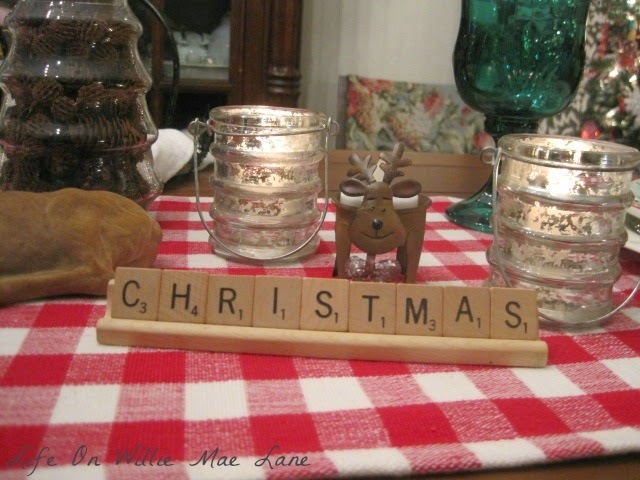 I already do that for Christmas, but I want to leave it all year....maybe! I bought this two cup measuring cup at World Market. It has the measurements on the inside. Mama had told me how much she liked hers like that and she spotted this one and showed it to me. Of course it came home with me...and how perfect that it was white. 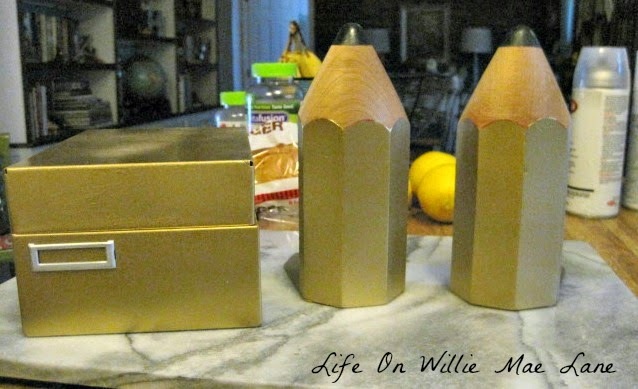 I have been wanting some gold striped candles and these are beautiful! I bought a few new sweet themed ornaments. I can't wait to share my sweet treat themed kitchen/dining room with you this year! I am planning to make a tree topper with the big candy canes. This is a Dala Horse ornament. Kindergarten studies Sweden for our Christmas Around the World program at school and the Dala Horse is a popular Swedish handicraft that I can share with my students. Look at the little wreath on the front! I found a few crafty things in the Target Dollar Spot. The little clothespins will be used for a Christmas project as well. and the three of us. I love both these ladies so much it hurts. For lunch, we went to Miranda's favorite place....Uncle Maddio's pizza joint. Oh my goodness...I now know why she loves it so much. It was amazing pizza...the BEST I have ever had. I will be returning. 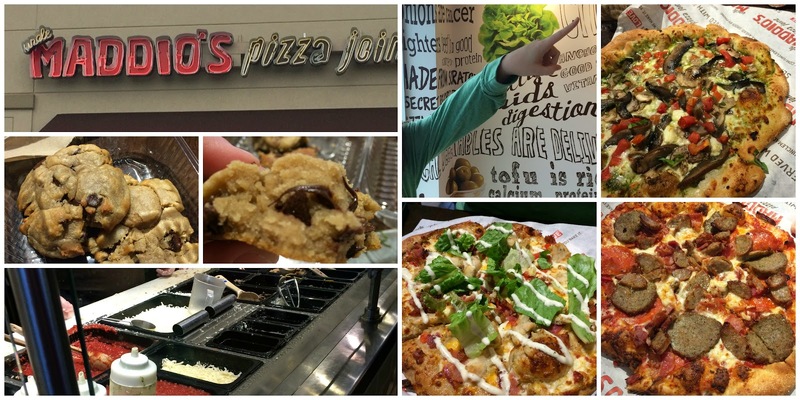 They assemble your pizza in front of you with fresh ingredients. I had the Portabello Pesto which had a white crust and sauce, portabello mushrooms, pesto, feta cheese, tomatoes, and spinach on it. They are baked in a brick oven and now I want to build one like Karen's hubby did over at The Feral Turtle! Miranda's was delicious as well...Chicken Club on wheat crust. Mama had a meat lover's which I didn't try because I am not a big meat lover. I do like meat, but prefer my pizza without it. They also bake these amazing thick and chunky chocolate chip cookies there...delicious! I will be back...EVERY time I visit! And one more thing...just for fun! Miranda's roommate, Amber was not there this weekend. 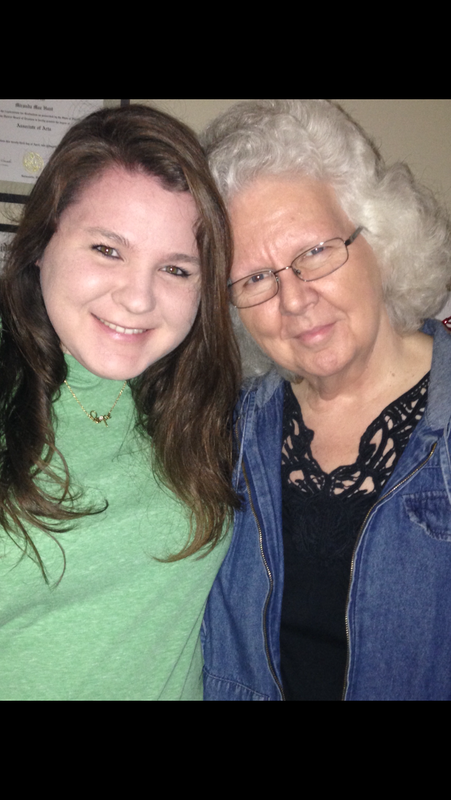 She was home visiting family and friends and this pretty lady you see below....her grandma. 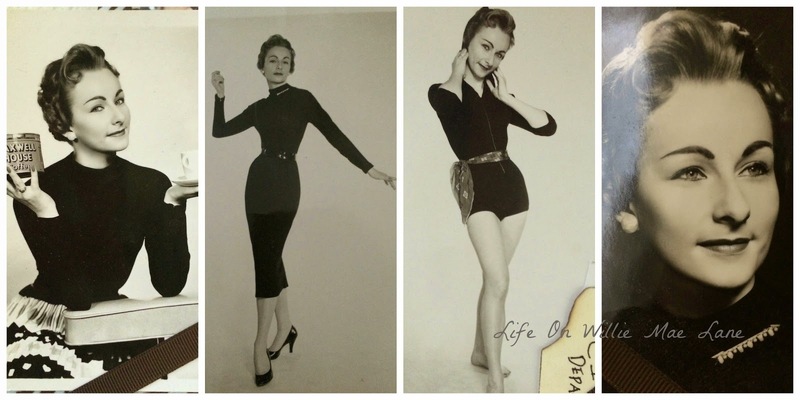 Now, these pictures were taken many years ago...when her grandma was a model for Maxwell Coffee. Isn't that so neat? She was a stunning classic beauty...was she not? I just thought you vintage lovers like myself would enjoy these pix. And with that ladies, I am off! Off to the post office to pick up a package that I was not expecting. Apparently my cousin's dog tried to eat the mailman's car tires and he didn't leave my package Saturday! Can't wait to see what it is...I love surprises! 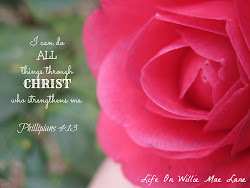 Have a blessed and beautiful Monday.